During this incredible program, students will live in the exciting and dynamic city of Hong Kong, a world class cosmopolitan city, and experience interaction with locals and cultural excursions. Earn credit, meet classmates from around the world, and take in the view from Mt. Victoria! 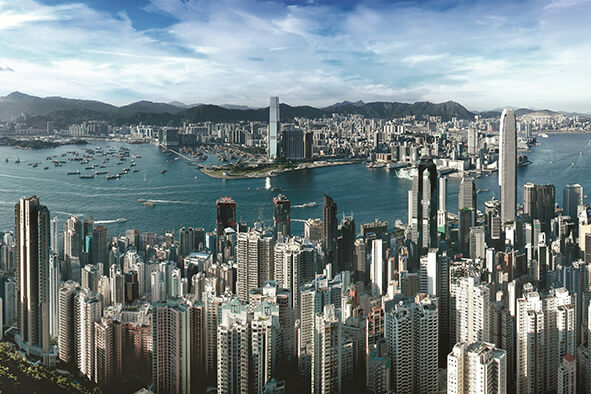 Hong Kong, in the heart of Asia, is a world class cosmopolitan city where east meets west. On this incredible summer program at Hong Kong Baptist University, students will take two classes in English and can earn up to six transfer credits from over 30 courses offered in the areas of Business, Communication, Economics, English, Film, Finance, History, Journalism, Marketing, Religion, Science and Sociology. Students will take classes with local, Mainland Chinese and other international students and will enjoy business visits and cultural activities including travel to Zhuhai and the Pearl River Delta region. Students are responsible for booking their own flights. Round-trip airfare from Orlando is estimated at $1700. HKBU provides airport pick-up on on the scheduled arrival dates. The International Office offers an orientation for new international students. The orientation includes an introduction to the University and welcome information and activities. Students are housed in the University's 21-storey Undergraduate Halls on the Baptist University Road Campus (BURC). The Undergraduate Halls, composed of the South Tower and the North Tower, provide some 800 rooms. Rooms are shared by two students and are air-conditioned (separately controlled in each room). For each occupant, the provision includes one bed, closet, desk and shelf, one chair, and one LAN point and WiFi connected to the University's network system. Linens (sheets, blankets and pillows) are provided. Every two rooms share a common restroom and shower facility. There is no telephone in the bedroom, but you can use the public telephones at the common areas of the Halls. Other facilities include a common lounge (with a small pantry) on each floor, a music/TV room, a multi-purpose room, a table tennis room, a computer room, a study room, and a laundry area. Students will take classes with local, Mainland Chinese and other international students. Cultural and leisure activities are built into the program so that students will have the opportunities to experience and learn about Hong Kong. The highligt of the program is a 3-day cultural tour of Macao. Advising is offered on a walk-in basis: Monday-Thursday from 12pm - 2pm. If you are unable to make it at these times, email us for an appointment. We can also put you in touch with members of our Global Ambassador Program. These are students whom have completed a study abroad program and would be happy to share their experiences with you. For application instructions, click the application link on the left side of this page. Please Note: This program has a required advising session (30 mins) as part of the application process. Please email Mary Robinson to schedule an appointment. Walk-in advising is for informational purposes only. Partial scholarships based on financial need are available to off-set program costs. Students apply for scholarships through the normal program application.